Hi SciCheer fans, Samantha here! 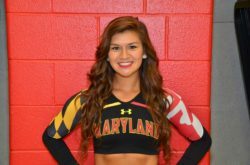 Welcome our latest SciCheer, Maya! She loves to cheer on her school and is excited about her future career in civil engineering. 1. What made you want to pursue STEM? My father was a math teacher and always pushed me into the STEM direction. I grew up always wanting to be just like my dad but found myself liking physics a lot more than he did. That’s how I chose civil engineering as my major! 2. Why did you try out to be a cheerleader? I love my school and wanted to represent it in every way I could! I also just could not imagine my life without cheerleading. 3. What does it mean for you to be a civil engineer? Civil engineers are always working to improve our day-to-day lives. Every day you use a highway, go in a building, and civil engineers work to make these things safely and for your enjoyment! 4. How do the qualities that make you a great cheerleader benefit you as an engineer? Teamwork is everything in engineering. While most engineers are are very introverted, being able to lead a team, encourage participation, and keep the team’s morale high is absolutely key! 5. How do you feel about challenging stereotypes about engineers and cheerleaders? I have received countless shocked faces when people hear what my major is. People will ask you “You do know that is really hard, right?” or “Wow, I would have never expected that!” and instead of taking these comments offensively, I decide to take them as a compliment to show that a cheerleader is MORE than capable to thrive in a male-dominated field. I am passionate about breaking this stereotype and hope the next generation is the one to prove them all wrong! 6. What was your best STEM experience? 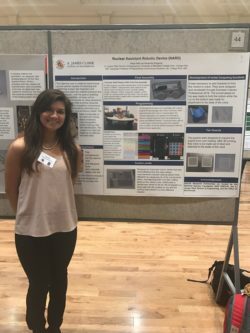 My best STEM-related experience was presenting my undergraduate research on a nuclear-assisted robot at the undergraduate research fair my freshman year! 7. What advice would you give your 12-year-old self? I would tell myself that you can achieve anything you are passionate about. That hard work toward something you love is never time wasted, and that you should never let someone else tell you what you were made for. Continue to do what makes you happy regardless of others’ opinions.